The number of diabetics in India is increasing day by day. In this metabolic disorder, the blood sugar levels are high either because the production of insulin is low or the cells of the body do not respond to insulin properly or both. 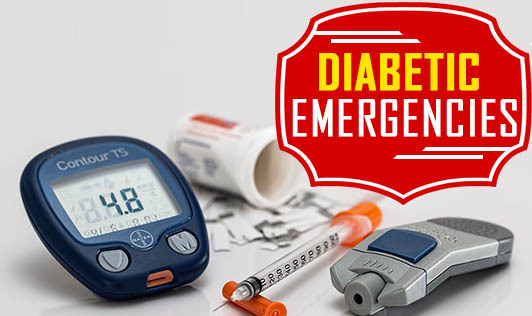 In a country with such alarming number of diabetics, it is important to know how to prevent diabetic emergencies. A person with diabetes can face life-threatening emergencies due to fluctuations of insulin levels in the body. High insulin levels can cause low sugar in blood called hypoglycemia leading to insulin shock. Low insulin levels can cause high sugars in blood called hyperglycemia which can lead to diabetic coma. • Numbness of feet or hands. • Drowsiness, gradual loss of consciousness. • If the person is unconscious, call for the ambulance immediately. • Place the person horizontally on a flat surface, check breathing, pulse and circulation, and administer CPR while waiting for professional medical help. • If the person is conscious, try to assist him with sugar or the prescribed medicine. • If the person appears disoriented or confused, give him or her something to eat and seek for medical help.